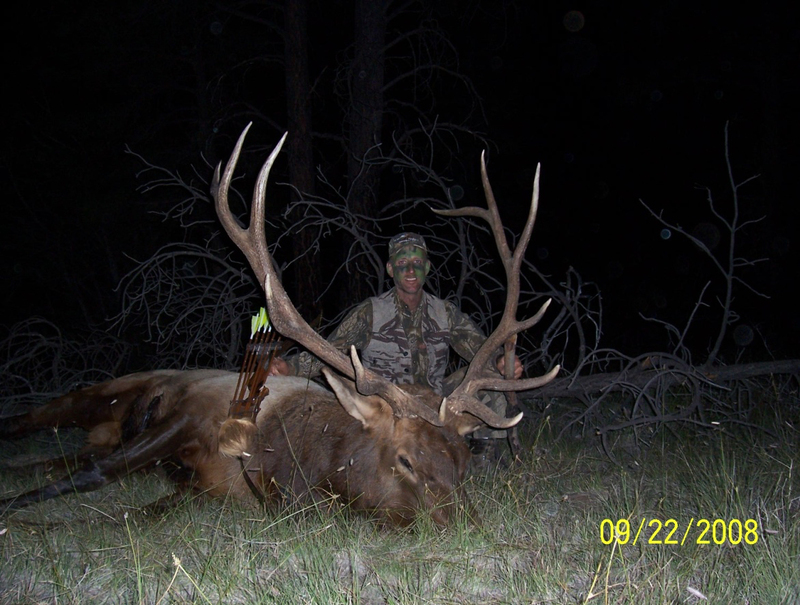 With elk season just a few short weeks away I thought this would be a good story to get your blood pumping! 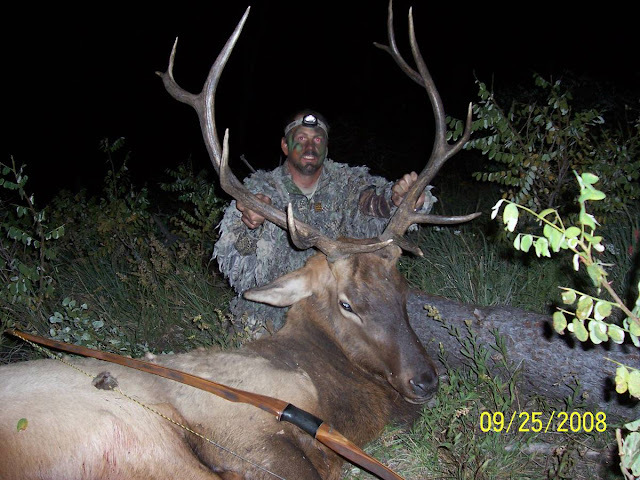 I'm always looking for good, original, bowhunting stories, told from the mouths of regular guys (but good hunters who know what they're talking about) to share with our readers. One of our good customers, friend, and dynamite bowhunter, Tavis Rogers shared this story with us in our store. The events of this story were so unique, and so exciting, that we asked Tavis to write the story in his words so that we could share it on our blog. I hope you enjoy it as much as we did. Here is Tavis' story, in his own words, about his incredible 2008 elk hunting season. I was leaving for an Arizona elk hunt in one day, but decided to hunt a little near home in Leadville, Colorado to get warmed up. I didn't really figure that I would kill a bull, but I thought that going through my gear and doing a little climbing would help before my hunt for the "big 'uns" down south. I spotted a group of elk going up a ridge with a good 6-point herd bull. A decent looking bull was hanging behind the rest of the herd as they worked up and over the ridge. He was a 5x5, and although smaller than the herd bull, he was by himself. With the wind in my favor, I worked between the main herd and the 5-point bull. He held up in a patch of smaller pines and looked like he was going to bed there by himself. I worked to within 25 yards using a big fallen pine tree as cover. With my bino's I could see him through the limbs of the fallen tree, standing broadside. He was looking my direction, so I thought I better find a hole to shoot through or he was going to get out of there. I moved slightly to my left and found a nice opening for my arrow. I drew back and let an arrow fly. Man, I love watching a good shot fly through the air right where you wanted it to go! Happens every now and then when you get lucky. I didn't see the actual impact, but it looked low and tight to the shoulder. “It should be a short tracking job”, I thought. I stood up and eased around the small pines he had been standing in and looked down the hill where he had run. He was standing in some willows about 100 yards below. He stumbled a little and then bedded. “I must have hit him really good!” I thought. I eased into where he had been standing at the shot and found some blood. I started down the blood trail and found my arrow a few yards past where he had been standing. It was covered from stem to stern with good blood. Not sure if it passed all the way through or fell out after a few hops, but it sure was pretty. I figured, "heck this is a slam dunk", and walked straight to where he laid down in the willows. He was bedded in the willows facing away from me. As I got to within 10 yards I noticed that he was still breathing. I still had the bloody arrow in my hand so I went ahead and nocked it as I eased around to the left. He must have heard or smelled me, and he stood up. I saw where the first arrow hit him, and it looked right on the money for a heart shot. But there was not a ton of blood pumping out like like you would expect from a heart shot. He started turning to his left as I hit full draw and shot again. The arrow disappeared into the same hole! Complete pass-through and out the other side! "Dang, I'm good sometimes!" I thought. "Just hope I can find the arrow in the willows." I step out from cover and into the open, congratulating myself on the great shooting and wondering if I will be able to find that arrow. As I step out, the bull turns to face me head-on...then he drops his head. He was not moving real fast and I figured he was fixing to fall over dead. Boy, was I wrong! Here he came! All I could see was antlers coming up toward my face! I didn't even have time to say "Oh, S!" He smacked me hard. All I could do was try to keep those antlers from poking me in the stomach and face. I was on the ground pretty fast just fending off antlers. I pulled my legs up to try and keep his kicks from hitting me in the groin and stomach. He pushed me up the hill by scooping at me with his antlers for about 20 yards right into a fallen tree and stump. I managed to get away from him and crawl under the stump. He smacked the stump a couple of times and then started staggering side to side and stumbled down the hill back into the willows. The bull locked up about 25 yards from me and was trying to stay upright on his feet facing away from me. I was a bit shook up, but noticed that my bow was not too far away. I crawled over there on my side, keeping low and hopefully out of sight. I got to my bow and found another arrow laying not to far away. I nocked it up and got to my knees. 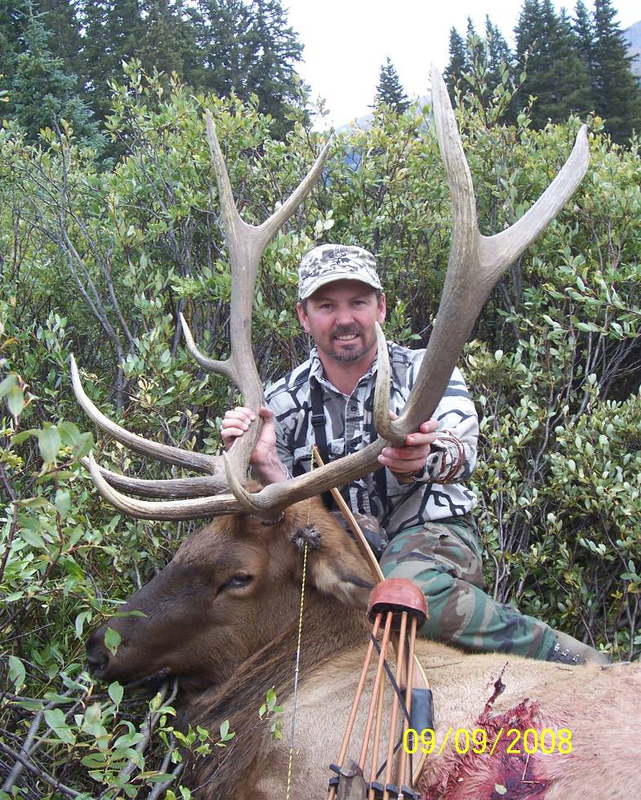 I had a hard quartering away angle on the bull and figured he needed some more killing, so I drew back and shot again. The shot hit in the ribs angling forward toward the offside shoulder. This was all he could take and he stumbled sideways, tipped over, and died in short order. What an adrenaline rush! I was shaking really bad and had to sit down for a while to get my wits about me. It is not everyday a guy gets in a fight with a critter that out weighs him by 5 times! By the time I could stand again, and not taking any chances, I gathered up the rest of my arrows and nocked another one before I eased up to him. This time he was fer-sure-dead. Took a few pictures and then started breaking him down for the pack out. I didn't really notice how beat up I was until several hours later. My legs, ribs, and back really started to hurt, a lot. The next day colors started to show up all over my body. 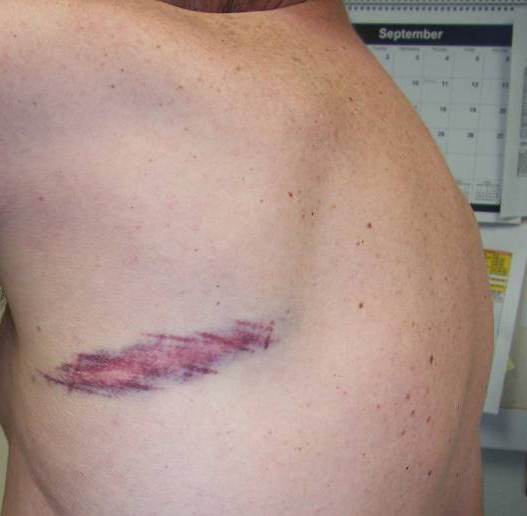 I had a real pretty stripe on my back where that bull had raked me and a couple of antler point marks over my kidneys. There were a number of big, hoof shaped bruises and scrapes on my thighs and shins that spread out till my legs were basically bruised from my groin to my feet. I was sore in about every muscle and bone in my body for about 4 days and the bruises stuck around for about two weeks. 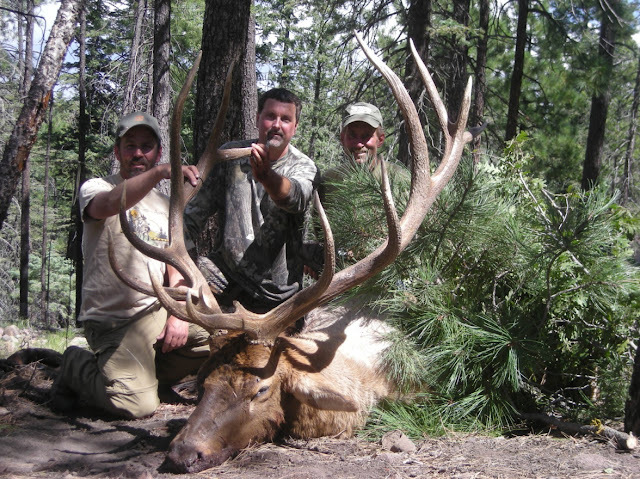 The moral of this story is: Don't ever walk up on an elk unless you know for darn sure that he is dead!! I didn’t have time to heal up with a great Arizona tag in my pocket. The drive down to Arizona was long and seemed even longer by my crippled up condition. I literally had to call my friend Lee when I got there to have him help me out of the truck. To make that long story short, I had a great time with good friends. I hunted every day of the hunt, chased some enormous bulls, helped two of my buddies get great bulls, had one of the best hunts of my life, and managed to kill a little bull on the last day of the hunt. Absolutely amazing! What a story!